The WSDL Toolbox provides elements you can use to rapidly develop a W3C Web Service Definition Language (WSDL) model, from which you can automatically generate WSDL documents. A Namespace represents the top-level container for the WSDL model. Drag this element onto an open diagram to create the necessary model structure for WSDL documents. A physical WSDL document is represented as a UML Component. 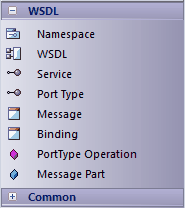 Its interfaces represent the WSDL Services. A WSDL Port Type is modeled as a UML Interface. Its Port Type Operations are realized by Binding elements. Each of the operation parameters is derived from the Message elements defined in the Messages Package.